But (touch wood) I now have my own little hobby room with pretty good lighting, space for all my gubbins and my main PC within immediate blogging distance! Wouldn't hold your breath on a torrent of blogging from here out, but i should be able to post alot more frequently as everything I need is in a single room! Painting wise, there has been progress! I have actually put paint to minis! The Heroquest stuff is all done except the gargoyle, which i have been promising Moritz would be done for the last few months! He is 50% complete, and i will do my best to get him done this week, pics posted and shipped as soon as i am done! On some personal mini stuff, here are a couple of minis that have been finished for me and my wife. We have just started playing pathfinder after finding an awesome couple that happen to be DM's and massive pathfinder fans. First up is Baal "Giant's Blood", my Barbarian ex pit fighter. Big Borris from Heresy Miniatures, with a few gubbins from my bitsbox to make him WYSIWYG, not really needed for RPG but years of playing GW games meant i had to! Next we have Amarylis, my wife's Half-elf druid and her animal companion Humpy (wow, how imaginative!). 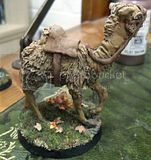 Autumn Bronzeleaf by Reaper minis, a really nice model with lots of detail which was a real pleasure to paint. Humpy was from eBay, and not so nice to paint, but will do for now. Next up is a model i am planning to use as a half-ork ranger named Bronn. Also from Heresy, Ebric the Doomed. And finally, here is my new toy! That's all for now, C and C are always welcome.